By David Dunning on Minster FM. The skies of York will once again be transformed by a fantastic array of colour and shapes this September when 50 hot air balloons will fly across the city for the York Balloon Fiesta. It’s sponsored by York’s Ultra Fibre Optic (UFO) network which is being rolled out in parts of the city by TalkTalk. From Friday 28th to Sunday 30th September, spectators will be able to enjoy a festival-style weekend packed with family friendly activities. 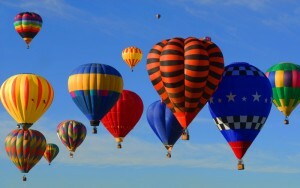 The spectacular display of colourful balloons will be visible from Knavesmire, home of York Racecourse. New for this year’s Fiesta will be a dazzling balloon night glow on both Friday and Saturday evenings, plus a firework display on the Saturday night. There will also be a fun fair, birds of prey show, children’s activities and entertainment, along with live music, a beer tent and tasty street food stalls from local Yorkshire vendors. The Fiesta will be more accessible than ever as the organisers have been working with partners across the city to provide even more car parking and transport options for the event.